The multi-lingual music video I dream of a world (Arabic: أغنية منتدى شباب العالم بحلم بمكان) is the official song for the World Youth Forum in Sharm ElSheikh, Egypt (November 2017). The video features Nicole Marie Knaus from Russia, Mayonde Masya from Kenya, Tania Breazou from Greece, Leesa from Korea, Thomas Grazioso from Italy, Amika Shail from India, Thais Macedo from Brazil, Mok Saib from Algeria, Hamad Al Qattan from Kuwait, and both Malak El Husseiny & Mohamed El Sharnouby from Egypt. Last September, the Saudi-funded TV channel MBC aired a phone interview with Bassel Al Rashedy, the owner of a popular Islamic Twitter account (1.3 Million followers), who said Qatar offered him 3 Million Saudi Riyals (800,000 US Dollars) to buy his account. The owner, who is Kuwaiti, said he had rejected the offer. Few days ago, video shows meeting between the account owner and Dr. Suleiman Aba Al-khail, the president of Saudi university, an ex-minister, and who serves also as a member of the Senior Clerks' Committee, the highest religious body in Saudi Arabia. The president of the university thanked Bassel saying we will cooperate with him, and emphasizing on university's role to spread word of mouth of spreading the message of Islam. After that, the account published a tweet thanking the previous account administrator, Bassel, and announcing a new administrator who will keep publishing hadiths in addition to defending Saudi Arabia's government, and people. دفع عضو "هيئة كبار العلماء" سليمان أبا الخيل مبلغا قدره 1.300.000 ريال لقاء شراء حساب باسل الرشيدي على تويتر صاحب الاسم "صحيح البخاري ومسلم"
The above tweet comes from a Twitter account that claims unveiling Saudi and Gulf top secrets from royal courts and decision making rooms. It says the president of the university paid 1.3M Saudi Riyals (346,700 US dollars) to acquire the Twitter account from its Kuwaiti owner. Since June 5th, political tension escalated between Qatar and its neighbor country the Kingdom of Saudi Arabia. Twitter is the most popular social media platform in the region where official ministers, and even royal family princes were posting, escalating, and acting as PR machines defending their countries' point of view. New Egypt Consulting is a digital marketing & social media agency based in Cairo since 2011. Is Russia Hacking Google Servers? 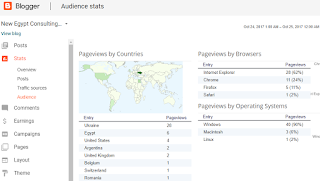 We host this blog on Blogger, which is a Google product hosted on Google servers. 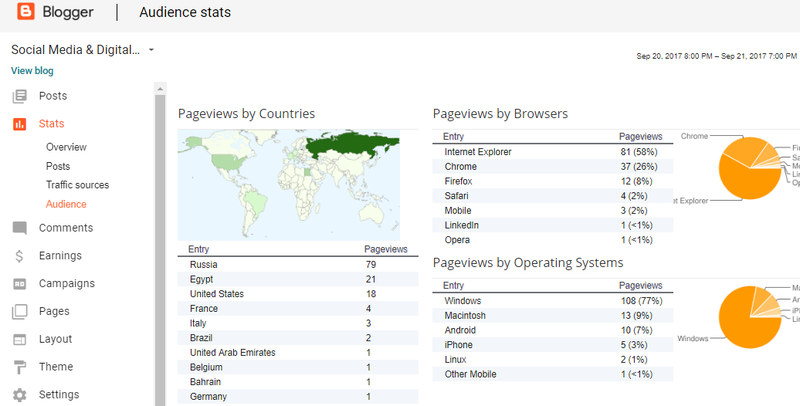 The story started with our Blogger stats dashboard shows a excessive traffic to it from Russia & Ukraine! This was strange for us for five reasons: we do not have Russian content, our services and campaigns are not targeting Russia, we do not work with Russian clients, they appear for a day or two before disappearing, and Google Analytics report doesn't show Russia or Ukraine! 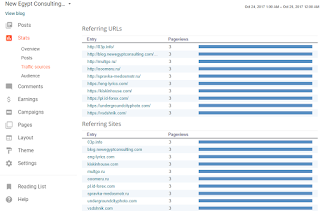 For those who are not aware, Google Analytics are different than Blogger stats dashboard as the latter collects data from all the traffic coming and going from your blog, which does include human traffic, but also includes bots and spam. 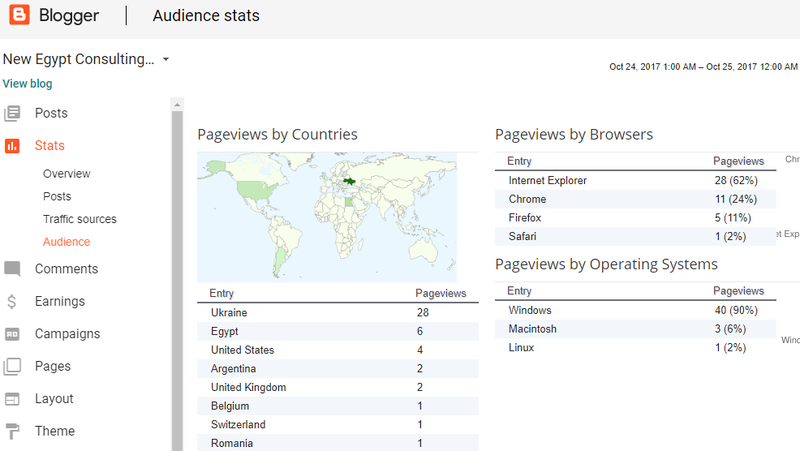 The above screen shot shows traffic during September 21st from Russia. Below screen shot for our blog clearly shows normal traffic coming from USA and Egypt (which is logic) while only 3 pageviews were coming from Russia (unlike excessive traffic from there 2 days ago)! With the news on the US election and the debate on the American President Donald Trump winning it due to Russian cyber interference. Can this post help in tracing the root causes for possible Russian activities targeting Google servers where our blog is hosted? Some clients are looking for going viral by asking social media marketing freelancers to share their content on Facebook groups and YouTube comments! If you are a social media agency, you should avoid submitting proposals there. 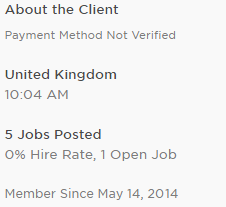 Payment method not verified, old registration date, previous jobs posted, and zero hire rate! Clients who have those 4 conditions together are usually looking for free tips and hints from the maximum number of agencies and freelancers on Upwork. Social media marketing agency or freelancer on Upwork? Some clients post a job and invite zillions of freelancers and agencies to submit proposals. If the number of invitations or interviews exceeds 10, we recommend you to avoid submitting a proposal. Usually, those clients are either hesitating on what they actually need, or are just looking to get free tips and hints from the maximum number of agencies and freelancers on Upwork. 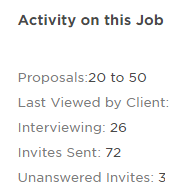 Jobs that are posted with an indicator of only one single invitation are usually jobs that know their way to a specific agency or freelancer, where client and service provider had already agreed to work on Upwork. If a client cheats the platform that brought you to him, he would cheat you as well, too. One client sent us her website to check after submitting our proposal. During a conference call, she said her graphic designer did not complete something because he started pursuing his master degree. She insisted that she paid his fees but he did not deliver. The entire story was a signal of something wrong. As we moved forward, she asked us to work outside Upwork, and of course, we rejected. Clients who have too many old inactive open contracts that started 1 or 2 years ago are a big question mark. 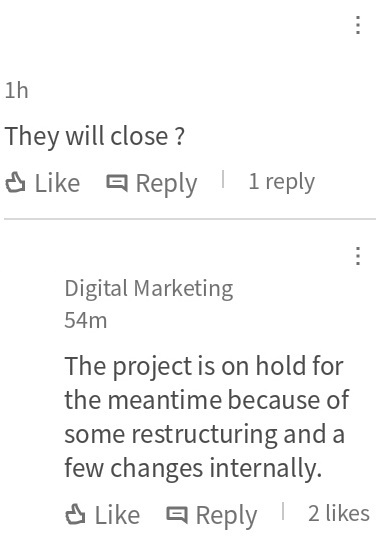 We had only 2 bad Upwork experiences out of total 14 projects. One of them was a client that falls under this category. Those clients usually have a bad behavior to their freelancers or agencies, so they do not end the contract to avoid getting a negative review. Unfortunately, Upwork lowers your JSS (Job Success Score) if you ended the contract yourself without waiting for the client to end it (which we did without knowing this fact). Our second bad Upwork experiences (Out of another 12 great experiences with excellent reviews) happened with a client that falls into this category. Those clients are usually willing to get your experience but are not willing to pay. He started to claim we agreed on a lower hourly rate (although the only client is the one who can send job offer with specific hourly rate where service provider can't increase), and asked our Upwork account manager to lower the rate to avoid getting a negative review that will lower JSS! In this case, even if you decided to stop working and end the contract, you will not get paid for the amount of work you've had delivered during the week (Was slightly less than $1,000) as you are not eligible to Upwork protection. In addition, your JSS will get lower (It went lower anyway due to client's review). While working with a new client on a daily basis, always make sure, on a daily basis as well, that her/his payment method is still verified. Hourly contracts protect the rights of agencies and freelancers much more compared to fixed cost projects. Agencies and freelancers should avoid proceeding with clients who post an hourly job but asks for hiring on a fixed cost basis, if and only if the client has negative reviews. Here at New Egypt Consulting, we faced this incident twice and when we checked clients' profiles again, we've found 2 stars review (without feedback) for one and an old 1-star review starts with capital AVOID feedback for another. Stakeholders: ITI, academia, training providers, HR trainers, recruitment companies, universities, etc. Program: Weekly sessions on YouTube, Soundcloud (less mobile data), video conferencing aired to universities' campuses - all to be broadcasted from TIEC or ITIDA to save investment costs and unify the message. Strategy: Partnership with Upwork to have a white-labeled portal under TIEC or ITIDA management and control so all Egyptian web developers, graphic designers, social media marketers, and software engineers (in addition to Egyptian companies) can deliver work to companies and clients from around the world, where TIEC/ITIDA and Upwork can share 20% commission of revenues this is already applied on the platform now. Stakeholders: universities, syndicate of engineers, chambers of commerce, banks, Egyptian embassies, etc. Budget: To be covered within 2 years by commission revenues. Here is SEO & marketing basics 101 for your YouTube videos: Having more social media fans, followers and subscribers only come after having more views to your videos. Both 1 & 2 above are only a result of having your YouTube video title, description, and tags optimized according to the latest algorithm updates on YouTube. The screen shot above for a YouTuber we're working with. Our social media manager (who is a YouTube certified from Google since 2014) optimized one of his videos according to YouTube's latest algorithm updates. Within 8 hours only, our optimization for his YouTube video got it 86% of views a 5 days old video had received and 7% of views a 3 weeks old video had received. New Egypt Consulting is a YouTube marketing & social media company based in Cairo since 2011. Top 10 Cairo Best Social Media Agencies! 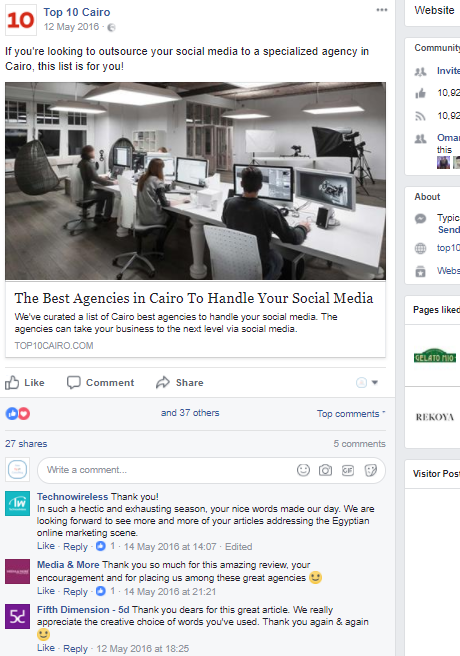 An article titled "The Best Agencies in Cairo To Handle Your Social Media" was published like a year ago on a website called Top 10 Cairo. This might be a very controversial topic but we can't hold ourselves from addressing it - clearly and professionally. We've been noticing that most of the comments are recommending only one specific social media agency. One comment by someone called Mahmoud, who claims to be a marketing head in a big company, was saying very negative comments on many of other listed and non-listed agencies while, again, recommending the same social media agency! Also, we've noticed that half of companies listed there were attacked by negative comments except only 4 companies of which 3 of them had thanked the website publicly! 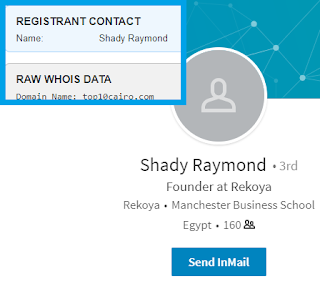 The website owner, Shady Raymond, is the founder of that specific social media agency, Rekoya! We are not against reviewing any agency or business at all, but we are against manipulating the market as that's a clear conflict of interest that needs to be addressed - again: clearly and professionally. New Egypt Consulting is a social media and digital marketing agency based in Cairo since 2011. Last month, companies posted total of more than 126 job vacancies on WUZZUF looking for candidates in social media (63 jobs), digital marketing (39 jobs), search engine optimization SEO (9 jobs), e-marketing (11 jobs), and digital advertising, digital media, or online marketing (total 4 jobs). Digital industry represents at least 5% of job market here in Egypt as companies posted more than 3,054 jobs last month on WUZZUF (More about social media versus digital marketing jobs). This 5% percentage includes, partially, other jobs that require social media skills such as marketing communications, public relations, and marketing. Interested to learn more about digital marketing recruitment in Egypt? New Egypt Consulting is a digital marketing company based in Cairo since 2011. 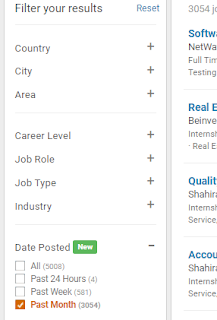 Companies looking for candidates with "social media" as part of their title posted more than 63 vacancies on WUZZUF, the Egyptian online recruitment job site, while 39 vacancies were posted with "digital marketing" as part of job title. The 63 social media job vacancies represented 50% of entire digital marketing and online media job vacancies posted on WUZZUF. The 39 digital marketing job vacancies represented 31% of entire social media and online marketing job vacancies posted on WUZZUF. For those 39 job vacancies, companies were only looking for 5 candidates (13%) to join as digital marketing managers while looking for 32 specialists (82%). Digital industry represents at least 5% of job market here in Egypt as companies posted more than 3,054 jobs last month on WUZZUF. Interested to learn more about recruiting digital marketing candidates in Egypt? New Egypt Consulting is a social media & digital marketing company based in Cairo since 2011. 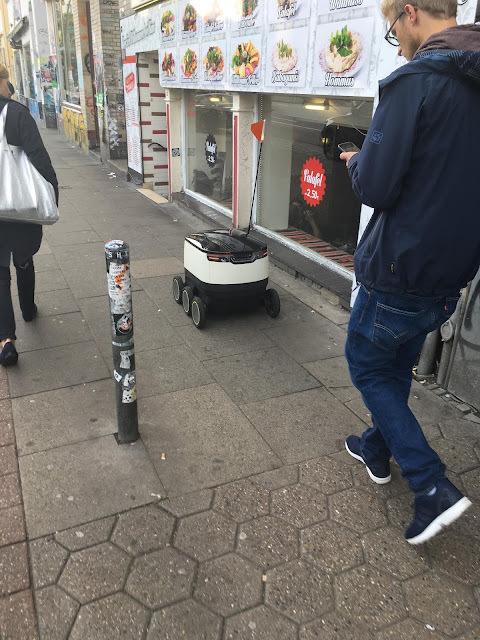 Bernhard Eberl shared a photo for a prototype of a self-driving delivery robot in Hamburg, Germany. The robot was engineered by Starship Technologies company. How do you think Internet of Things or IoT, could be applied here in Egypt? Social Media Day is an annual global event on June 30 that recognizes the digital revolution happening right before our eyes. 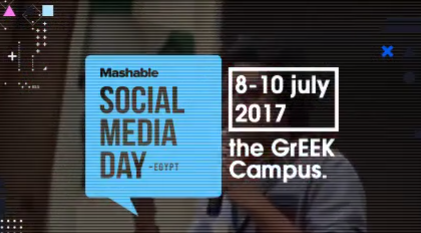 Social Media Day Egypt was held a few days ago in the Greek Campus here in Cairo as a 3-day event. Is writing a skill or a talent? How to improve your writing? Chatbots: Why & How to Start? YouTube Vs. Facebook: Which is better for your content? Ian Manning, Facebook (Regional Head of Agencies for MENA for Instagram as well). Will the Gulf crisis evolve into regional war with military operations against Qatar? Many Qatari social media influencers had started to promote the account to their followers. The official account on the social media platform Twitter indicates its joining date: 2 years ago! It was June 17th when first tweet was published to the account- only 12 days after 4 countries decided to cut diplomatic and trade relations with Qatar. The second tweet is published today, which marks 20 days after first tweet. Do you think Ministry of Defense in Qatar is getting prepared for some action soon? New Egypt Consulting is a Twitter marketing & social media company based in Cairo since 2011. Personal Facebook Accounts For Sale! Well, this is not a joke! 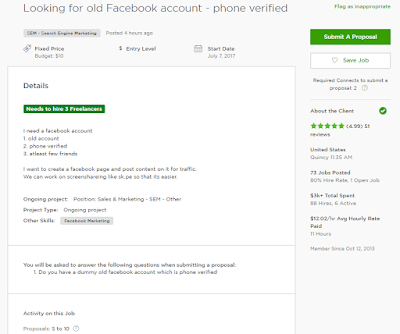 It is a project that is being published on the freelancing website Upwork, where someone from the American city Quincy is willing to buy 3 personal Facebook accounts offering 10 dollars per account. Surprisingly, Facebook accounts are all needed to be phone verified with existing friends! 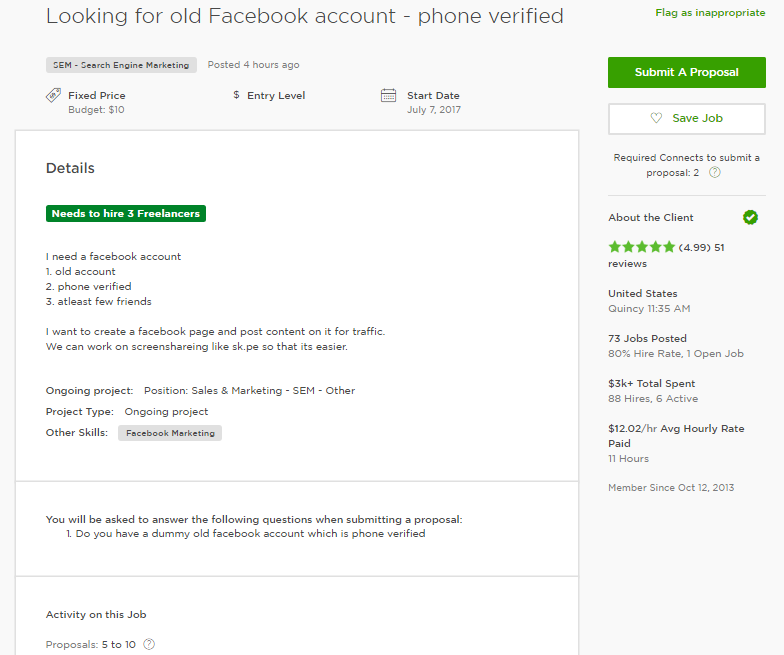 From your point of view, why would someone needs to seek multiple old Facebook accounts? New Egypt Consulting is a Facebook marketing & social media company based in Cairo since 2011. 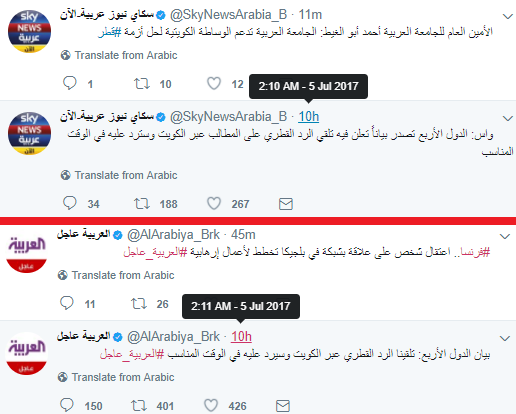 The official Twitter accounts for the 2 Dubai-based TV satellite news channels AlArabiya and Sky News Arabia were frequently seen idle on Twitter for more than 9 hours without a single tweet to their breaking news accounts! Qatar crisis is the topic everyone is talking about in the middle east. The crisis started in June 5th by 4 countries (Egypt, UAE, Saudi Arabia, and Bahrain) cutting their diplomatic and trade relations with Qatar. Three countries are members of Gulf Cooperation Council, where Qatar is a member there as well. Twitter is the most popular social media platform in the Gulf region. Hence, breaking news, rumors, leaks, discussions, etc all were being evolved in tweets, triggering viral trending Twitter hashtags sometimes. Today marks the first conference for the foreign ministers of the 4 countries together to comment on Qatar's response to their demands in a press conference here in Cairo. However, 10-hour gap is seen for the official Twitter accounts of three pan-Arab news channels, frequently. Which is a big NO! This was the case for the official Twitter accounts for the 2 Dubai-based TV satellite news channels AlArabiya and Sky News Arabia were frequently seen idle on Twitter for more than 9 hours without a single tweet to their breaking news accounts! AlJazeera, that promotes Qatar point of view in the Gulf crisis, is also seen idle on Twitter for half a day! It is 1:35PM Cairo time and no single tweet was published to AlJazeera breaking news account on Twitter! How to Get 100,000 Organic Facebook Fans? Ahmed Mohsen is a young social media activist who publishes Facebook posts that are more of investigative journalism. His personal profile posts were widely circulated online among Egyptian youth as he always mentions sources URLs while summarizing trending events in the country. During 16 months, he published 125 posts that were shared more than 275,000 times as an accumulated total number - according to his own post above that announces reaching 100,000 followers. Ahmed invests time in publishing a unique content to his Facebook page or personal profile. He doesn't copy and paste his content from somewhere else. He loves to organize the Facebook post itself to make it much easier for readers to go through the post tirelessly. His Facebook posts are usually lengthy, so he doesn't increase its length with long URLs from different news sources he is referring to. 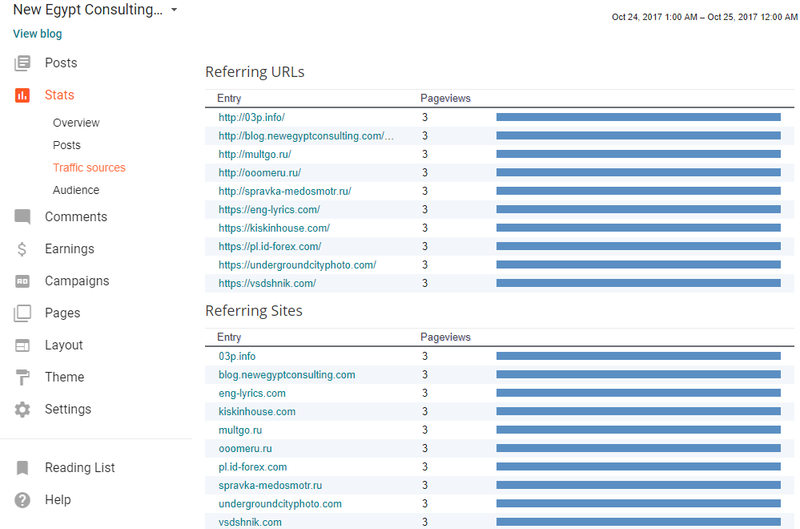 Instead, he used Bitly URL shortening service provider to reduce the clutter. Ahmed listens to conversations and comments on his published content. He engages with some commentators. If someone posted a comment or a criticism that is valid, Ahmed immediately edits his Facebook post accordingly. Liana Evans said that social media marketing is all about return on conversation, and so does Ahmed practice this. Ahmed's content is all about news, and trending news specifically. News mean time. Time on social media equals shares and engagement. He publishes his investigative Facebook posts within usually very few hours from the propagation of whatever news related to an incident, terror attack, viral press conference, or a stupid governmental action. He simply applies a very simple integrated marketing communications, yet organic, tactic: He adds the Twitter trending hashtag(s) to his Facebook post to maximize the visibility of his content. The social media activist was keen to analyze his performance, and measure engagement metrics. That's a very interesting, yet essential, action actually. 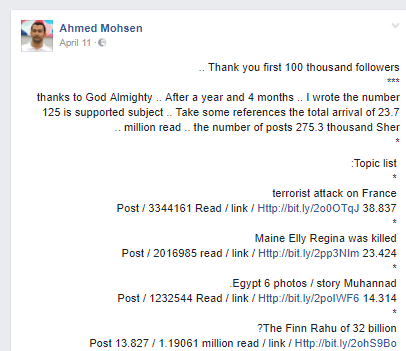 Between 11th of April (Publication date for his Facebook post above) and today 30th of June, Ahmed Mohsen gained more than 3,489 new Facebook fans or followers - kindly note that he had deactivated his Facebook account for 10 successive weeks. New Egypt Consulting is a social media & digital marketing agency based in Cairo since 2011. Two years ago, the social media platform Facebook announced its Take a break feature in an official post by its its product manager Kelly Winters titled "Improving the Experience When Relationships End". Less than two week ago, Facebook users started to see Take a break as an option when browsing a Facebook profile for a friend, while clicking on Friends on mobile devices. This new feature has not enabled on Facebook mobile application. 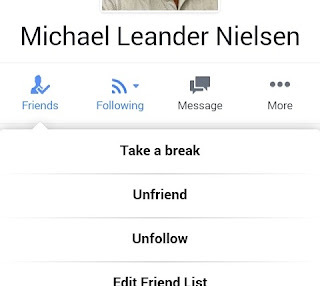 It seems that Facebook is trying to make News Feed navigation much noiseless for its user by rolling-out this feature to personal profiles navigation options after being in quiet mode for two years. 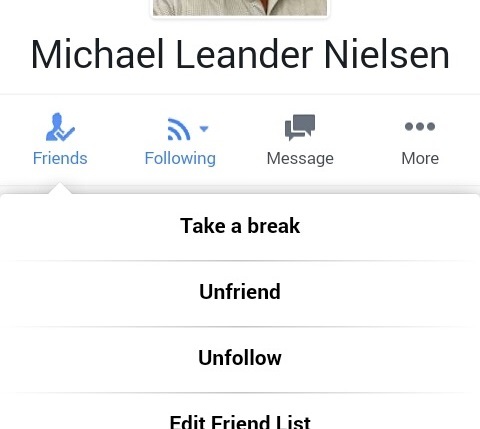 Another indicator for Facebook's eagerness to make reduce the amount of noise for its users' News Feeds is suggesting unfollowing Facebook friends when one is unfollowed on a mobile device. In this case, Facebook was showing a screen asking if you want to unfollow more people. Once clicked, a list of Facebook friends appears, where you could easily unfollow as much of them as you can. New Egypt Consulting is a Facebook & social media marketing company based in Cairo since 2011. Nothing new about Facebook paying more attention to videos. 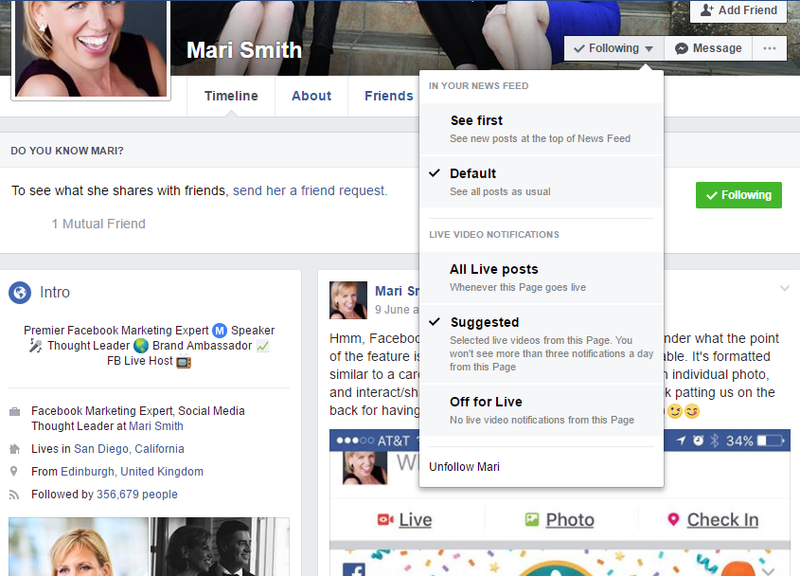 A couple of weeks ago, Facebook desktop users started to see 3 options for personal profile's live video notifications. The most interesting fact is: This feature has been disabled as of now! It seems like something Facebook was testing for a while. Customs Authority Enforces Internet Explorer Browser! 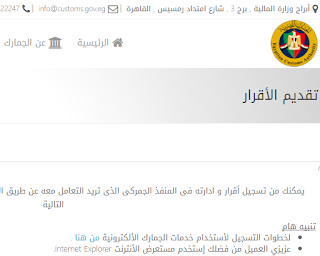 The Egyptian customs authority enforces its electronic government service users to use only Internet Explorer browser by Microsoft company. The official website for the governmental organization clearly listing this as an important note to be taken into consideration before using its e-gov solutions. New Egypt Consulting is a social media and digital marketing company based in Cairo since 2011. 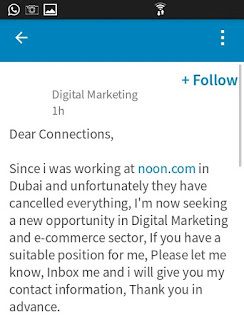 Dubai-based Saudi E-Commerce Website Noon Put On-hold! 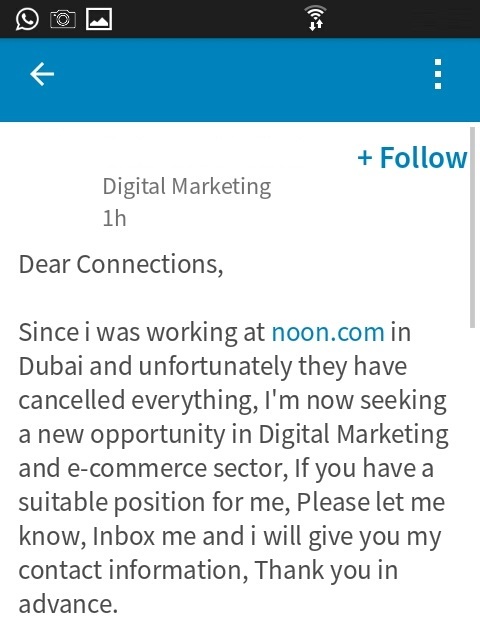 Yesterday, a Dubai-based Noon employee posted an update on his LinkedIn profile saying he is looking for a job as Noon had cancelled everything. 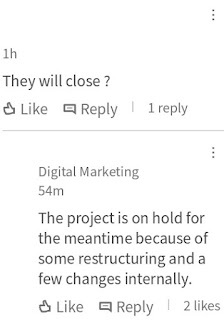 When asked if they will close, the employee responded "The project is on hold because of some restructuring and a few internal changes". Arabian Business portal published an emailed statement from Noon a couple of weeks ago that reads "Due to the shift in our operational base [To Saudi capital Riyadh] and the need for even greater efficiencies, there have been nominal staff reallocations and changes"
A regional debate has been raised since the announcement of Noon.com that is based in Dubai. Some were asking if it is the right step for giant investors to invest in an e-commerce website. The debate was triggered recently again with Amazon acquiring Souq, another famous e-commerce website, couple of months ago given a higher bid offer from a Noon investor to acquire Souq itself! More details about such conflict of interest in the report (CEO Conflicted Entrepreneurial Officer). New Egypt Consulting is an e-commerce & social media company based in Cairo since 2011. The social media websites Facebook & YouTube have celebrated the holy month of Ramadan in their own way. 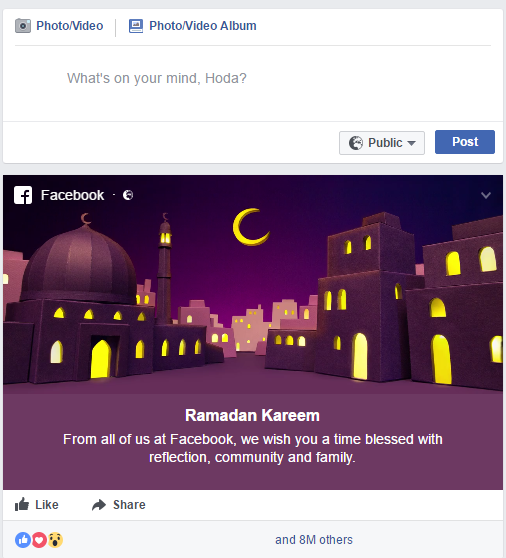 Facebook News Feed displayed a greeting message saying "Ramadan Kareem" with millions of users have engaged with the post. The post appears as a message from Facebook but not as a page post. On the other side, the famous video sharing website YouTube added the fanous (lantern) to its platform logo. New Egypt Consulting is a social media marketing company based in Cairo since 2011. 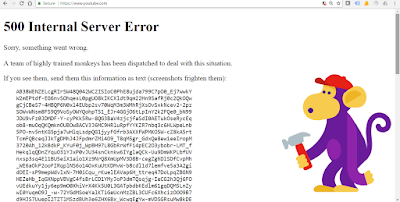 YouTube is Down: 500 Internal Server Error! 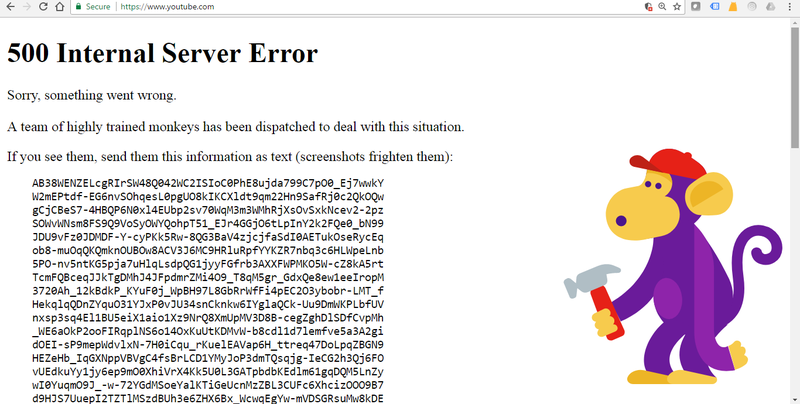 The giant video sharing social media platform YouTube is down worldwide. The website is out of service since (at least) 1:40AM GMT, showing 500 internal server error message with its famous monkey. New Egypt Consulting is a YouTube marketing and social media company based in Cairo since 2011. EXCLUSIVE: Facebook Prepares for Publishing a Newspaper! It is now confirmed by Juan Señor, an Oxford former visiting fellow: Facebook, the giant social media platform, is preparing for publishing a printed newspaper! Juan Señor, who is a partner in the London-based Innovation Media Consulting Group, was talking to a group of media personnel and press journalists in a lecture held in the American University in Cairo (AUC). Juan Señor's quote was mentioned in the prominent daily Egyptian newspaper Shorouk (Saturday 13th of May) by its editor-in-chief Emad El-Din Hussein who attended the lecture himself. Couple of years ago, Amazon CEO Jeff Bezos bought The Washington Post. Do you think Mark Zuckerberg is planning to do something similar, or will start Facebook's own publication? New Egypt Consulting is a Facebook marketing, digital publishing, and social media company based in Cairo since 2011. Once the Egyptian Ministry of Communications and Information Technology has been formed in the late 90s, the Egyptian government had invested in building a reliable telecom infrastructure to boost the IT industry in Egypt. IT industry enjoys high profit margins, high salary rates, and unlimited governmental initiatives and support. Facebook linked group feature is activated for groups created by Option B Facebook page. The social media platform Facebook said it is testing new features that link brand pages and groups, according to CNET report published few a couple of weeks ago. 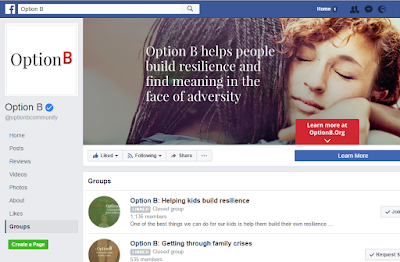 Option B page is a community to help people face adversity and build resilience. It is inspired by Option B book by Sheryl Sandberg and Adam Grant. Sheryl is the chief operating officer (COO) of Facebook. Groups tab appears on the Facebook page of Option B listing communities to help people face adversity and build resilience. Two days ago, the Egyptian President Abdel Fattah El-Sisi attended the monthly youth conference. The Arabic unified hashtag that is used to cover conference news online was taken from a song by a famous underground band. The official Facebook page for our President was posting quotes from his speech. 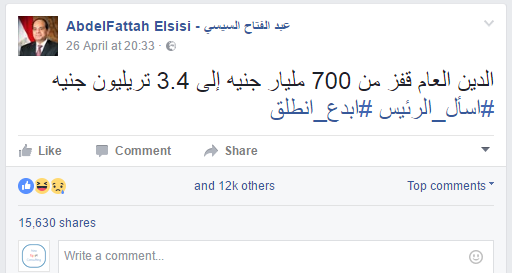 The viral Facebook text post was quoting our President saying "Government debt jumped from EGP 700 billion to 3.4 trillion (3,400 billion)". 2- Ignoring a fact: The President in the video (starting minute 11) talked clearly about debt growth from 2011 to 2017, not only during his term. Imagine a CEO of a company talking about debt growth from establishment date till the moment, while his body language shows him happily looking for more growth (in debt!). It is about the context that hashtag wasn't matching at all for this specific Facebook post. Now, imagine this same company CEO not emphasizing on the fact that debt growth was for the period from the year the company was founded 6 years ago (he was appointed only 2 years ago) until the moment! What about President's official Twitter account? The conference always gets trending on Twitter, which adds fuel to the fire. 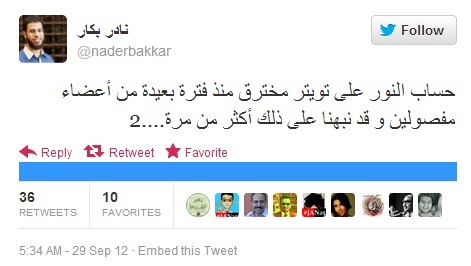 However, this specific was not tweeted by the official Twitter account of the Egyptian President Abdel Fattah El-Sisi. Our team noticed that the order of posts published on his official Facebook page is different compared to same content published on his official Twitter account. As posts were published 20 minutes after being actually aired on the television, we tend to believe that either an excerpt from the speech was published online randomly, or posts were published based on the Presidential social media team members own choices. Social Media Analytics Company: IPO? Can we see a social media analytics company applies for an initial public offering IPO? Cloudera, Inc. (NYSE: CLDR), the provider of the machine learning and advanced analytics built on the latest open source technologies, announced the pricing of its initial public offering of 15,000,000 shares of its common stock at a price to the public of $15.00 per share. The share price jumped to $18 on the first day today. Big data and machine learning are used for social media analytics, online listening insights, and brand mentioning applications. 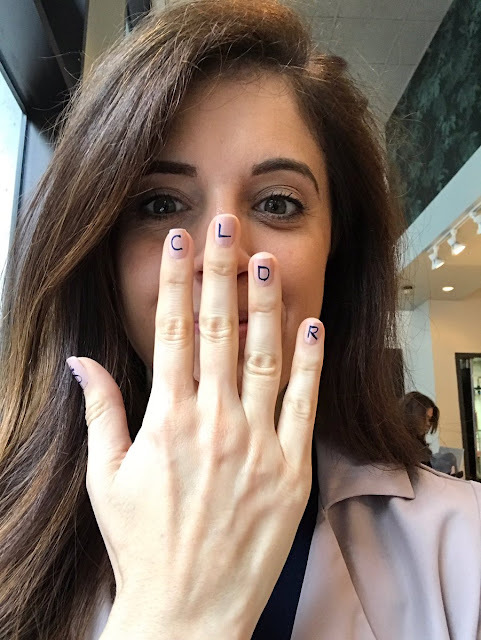 The case of Cloudera makes it possible for any social media analytics company with a solid business model based on a reasonable amount of users and/or traffic volume to apply for IPO. What do you think? New Egypt Consulting is a social media analytics and digital PR company based in Cairo since 2011. Desktop video view for the waiting YouTube Live feature from the official channel of The Vatican. 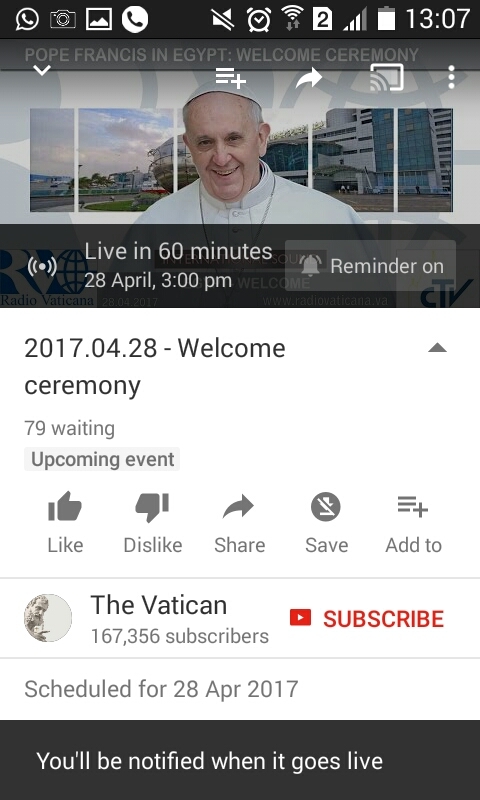 Today, we will highlight a YouTube live feature which is the waiting feature as per the above desktop screenshot. 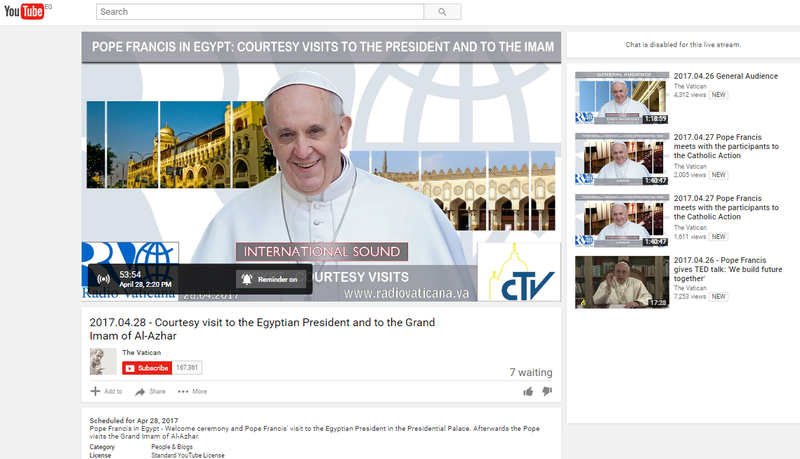 The YouTube video will stream the official Pope visit to our President, our Grand Imam of Al-Azhar, and our Coptic Pope once Pope Francis arrives. 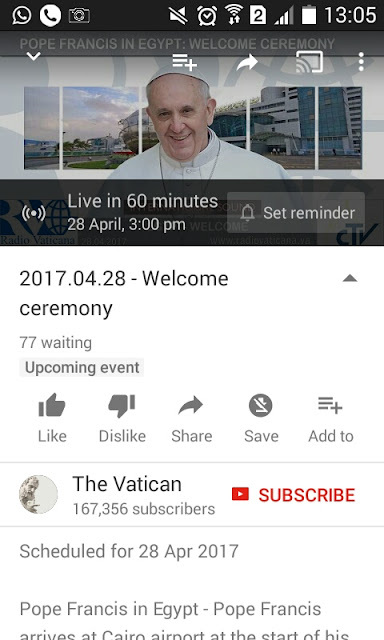 Now, the YouTube views counter is counting how many are waiting instead. Viewers can also set a reminder as per below screen shot from the YouTube mobile application itself. An internal group within a political party in Egypt decided to separate and to hijack party's official accounts. The official spokesman announced on Twitter that the party on social media has been hacked! Who should manage and own access to social media accounts? And how to secure social media accounts of your company? It is highly recommended to limit access to the domain, hosting and email management control panel to specified employees who are directly reporting to senior board members. One of the important email marketing reports is the Open report. It shows how many of your recipients had actually opened your email marketing message. Generally speaking, each and every industry has its own average (percentage). The above screenshot for a report from a campaign on iContact shows multiple opens for the email marketing message from a single recipient (31 times for the first-row email address). The email address itself is an alias that is being forwarded to different employees within the company. We've been noticing that many recipients who contact us or our clients after an email newsletter are usually one of those who achieves multiple opens. How to optimize LinkedIn advertising campaign? While we always recommend companies to be careful while advertising on LinkedIn as cost per click (CPC or PPC) is very high compared to AdWords and Facebook, they need to consider the target audience. For example, once we target Kuwait, Qatar, Saudi Arabia, Egypt and United Arab Emirates, LinkedIn shows a target audience of 49,000 members. Once we deselect UAE, the counter went down to only 23,000 members. This means that UAE members are contributing to 50% of total LinkedIn members among those 5 countries. 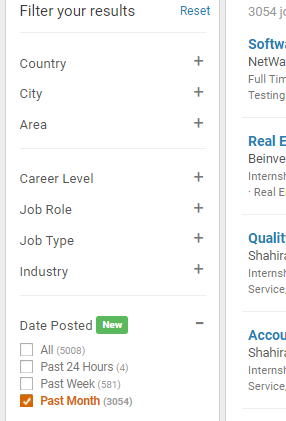 While the screenshot is back to 2011, it is important to note that many of active LinkedIn members are based in UAE. However, it seems that Saudi Arabia has joined the momentum having almost same LinkedIn members as UAE, according to Statista numbers for Q1 2016. It worth mentioning that LinkedIn itself unveiled yesterday that UAE professionals are the most web-connected globally as LinkedIn members in the UAE have an average of 211 connections making it ahead of the rest of the world.